Herfeld, Catherine 2017. Between mathematical formalism, normative choice rules, and the behavioural sciences: The emergence of rational choice theories in the late 1940s and early 1950s. The European Journal of the History of Economic Thought, Vol. 24, Issue. 6, p. 1277. Andrews, Paul 2015. Mathematics, PISA, and culture: An unpredictable relationship. Journal of Educational Change, Vol. 16, Issue. 3, p. 251. Heukelom, Floris 2010. Measurement and decision making at the University of Michigan in the 1950s and 1960s. Journal of the History of the Behavioral Sciences, Vol. 46, Issue. 2, p. 189. Hands, D. Wade 2010. Stabilizing consumer choice: the role of ‘true dynamic stability’ and related concepts in the history of consumer choice theory. The European Journal of the History of Economic Thought, Vol. 17, Issue. 2, p. 313. LIZARDO, OMAR 2009. Formalism, Behavioral Realism and the Interdisciplinary Challenge in Sociological Theory. Journal for the Theory of Social Behaviour, Vol. 39, Issue. 1, p. 39.
de Bruin, Boudewijn 2009. Overmathematisation in game theory: pitting the Nash Equilibrium Refinement Programme against the Epistemic Programme. Studies in History and Philosophy of Science Part A, Vol. 40, Issue. 3, p. 290. Reay, Mike 2007. Academic Knowledge and Expert Authority in American Economics. Sociological Perspectives, Vol. 50, Issue. 1, p. 101. Lee, Frederic S and Keen, Steve 2004. The Incoherent Emperor: A Heterodox Critique of Neoclassical Microeconomic Theory. Review of Social Economy, Vol. 62, Issue. 2, p. 169. Blaug, Mark 2003. The Formalist Revolution of the 1950s. Journal of the History of Economic Thought, Vol. 25, Issue. 02, p. 145. Andler, Martin. 1988. “Entretien avec trois membres de Nicolas Bourbaki.” Gazette des Mathématiciens 35: 43–49. Artin, E. 1953. “Review of Bourbaki [Elements, Book II, Chapters 1–7 (1942–52)].” Bulletin of the American Mathematical Society 59: 474–79. Beed, Clive, and Kane, Owen. 1992. “What Is the Critique of the Mathematization of Economics?” Kyklos 44: 581–611. Borges, Jorge Luis. 1964. Labyrinths. New York: New Directions. Bourbaki, Nicolas. 1949. “The Foundations of Mathematics for the Working Mathematician.” Journal of symbolic Logic 14(1): 1–8. Bourbaki, Nicolas. 1950. “The Architecture of Mathematics.” Americam Mathematical Monthly 57: 221–32. Browder, Felix. 1989. “The Stone Age of Mathematics on the Midway,” in Duren 1989. Campbell, Douglas M., and Higgens, John C., eds 1984. Mathematics: People, problems, Results, vol 1. Belmont, Calif.: Wadswroth. Cartan, Henri. 1943. “Sur le fondement logique des mathématiques.” La Revue Scientifique: Revue rose illustrée 81(1): 3–11. Cartan, Henri. 1980. “Nicolas Bourbaki and Contemporary Mathematics.” The Mathematical Intelligencer 2(4): 175–80. Additionally published as “Nicolas Bourbaki und die heutige Mathematik,” Arbeitsgemeinschaft für Forschung des Landes Nord. Westf., vol. 76, 1979. Caws, Peter. 1988. Structuralism: The Art of the Intelligible. London: Humanities Press. Chihara, Charles. 1990. Constructability and Mathematical Existence. Oxford: Clarendon Press. Christ, Carl. 1952. “History of the Cowles Commission, 1932–1952.” In Economic Theory and Measurement. Chicago: Cowles Commission. Christ, Carl. 1994. “The Cowles Commission's Contributions to Econometrics at Chicago, 1939–1955.” Journal of Economic Literature 32: 30–59. Corry, Leo. 1989. “Linearity and Reflexivity in the Growth of Mathematical Knowledge.” science in Context 3(2): 409–40. Corry, Leo. 1992a. “Nicolas Bourbaki and the Concept of Mathematical Structure.” Syntheses 22: 315–48. Corry, Leo. 1992b. “Nicolas Bourbaki and the Structuralist Program.” Unpublished. Debreu, Gérard. 1959. The Theory of value. New Haven: Yale University Press. Debreu, Gérad. 1983. Mathematical Economics: Twenty Collected Papers of Gérard Debreu. New York: Cambridge University Press. Debreu, Gérard. 1984.“Economic Theory in the Mathematical Mode.” American Economic Review 74(3): 267–78. This is a reprint of Debreu's Nobel prize lecture, which originally appeared in Les Prix Nobel, 1983, Stockholm, The Nobel Foundation. Debreu, Gérard. 1986. “Theoretical Models: Mathematical Form and Economic Content.” Econometrica 54(6): 1259–70. Debreu, Gérard. 1991. “The Mathematization of Economic Theory.” American Economic Review 81(1): 1–7. Debreu, Gérard. 1992a. “Random Walk and Life Philosophy.” In Eminent Economists: Their Life Philosophies, edited by Szenberg, Michael, 107–14. New York: Cambridge University Press. Debreu, Gérard. 1992b. Interview with Roy Weintraub, Berkeley, 4–5 May. Dieudonné, Jean. 1939. “Les méthodes axiomatiques modernes et les fondements des mathématiques.” La Revue Scientifique: Revue rose illustrée 77(3): 224–32. Dieudonné, Jean. 1970. “The Work of Nicolas Bourbaki.” American Mathematical Monthly 77: 134–45. Dieudonné, Jean. 1982a. A Panorama of Pure Mathematics (as seen by Nicolas Bourbaki), translated by Macdonald, I. G.. New York: Academic Press. Dieudonné, Jean. 1982b. 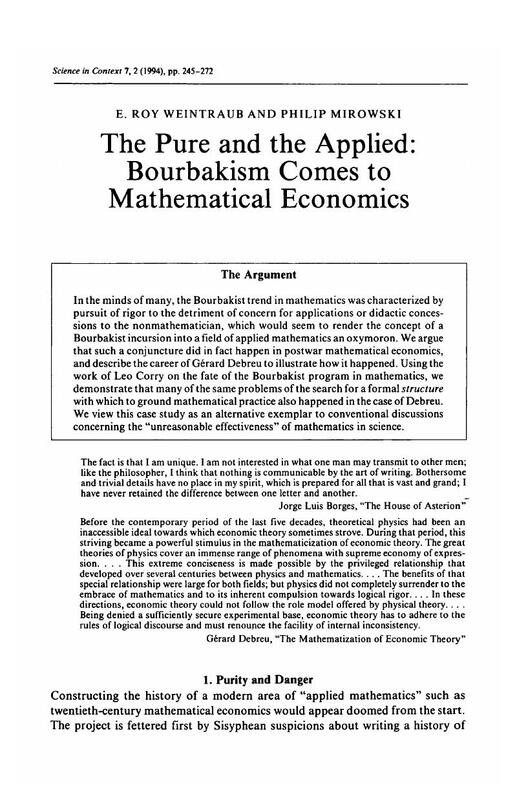 “The Work of Bourbaki in the Last Thirty Years.” Notices of the American Mathematical Society 29: 618–23. Dieudonné, Jean. 1992. Mathematics — The Music of Reason. Berlin: Springer Verlag. Douglas, Mary. 1989. Purity and Danger. London: Ark. Dreze, Jacques H. 1964. “Some Postwar Contributions of French Economists to Theory and Public Policy, with Special Emphasis on Problems of Resource Allocation.” American Economic Review 54(4, part 2, Supplement): 1–64. Duren, Peter, ed. 1989. A Century of Mathematics in America, Part II. Providence, R.I.: American Mathematical Society. Epstein, Roy. 1987. A History of Econometrics. Amsterdam: North Holland. Ewing, John. 1992. “Review of The History of Modern Mathematics.” Historia Mathematica 19(1): 93–98. Feiwel, George. 1987. “Oral History II: An Interview with Gérard Debrey.” In Arrow and the Ascent of Modern Economic Theory, 243–57, edited by Feiwel, George. London: Macmillan. Frink, O. 1950. “Review of Bourbaki 1949.” Mathematical Reviews 11: 73. Gandy, R. O. 1959. “Review of Bourbaki.” Journal of Symbolic Logic 24: 71–73. Gell-Mann, Murray. 1992. “Nature Conformable to Herself.” Bulletin of the Santa Fe Institute 7(1): 7–10. Gilles, Donald, ed 1992. Revolutions in Mathematics. Oxford: Clarendon press. Grandmont, Jean-Michael. 1984. “Gérard Debrey, Prix Nobel d'Economie 1983.” Société d'études et de documentation économiques, industrielles et sociales 38 (Mars): 1–2. Guedj, Denis. 1985. “Nicholas Bourbaki, Collective Mathematician: An Interview with Claude Chevalley,” translated by Grey, Jeremy. Mathematical Intelligencer 7(2): 18–22. Gutting, Gary. 1989. Michel Foucalut's Archaeology of Scientific Reason. New York: Cambridge University Press. Hildenbrand, Werner. 1983a. ”An Axiomatic Analysis of the Economic Equilibrium: On the Award of the Nobel Prize to Gérard Debreu.” Neue Zurcher Zeitung. November 4. Hildenbrand, Werner. 1983b. “Introduction.” In Debreu 1983, 1–29. Hildenbrand, Werner. 1994. Market Demand, Princeton, N.J.: Princeton University Press. Ingrao, Bruna, and Israel, Giorgio. 1990. The Invisible Hand: Economic Equilibrium in the History of Science. Cambridge, Mass. : MIT Press. Israel, Giorgio. 1981. “Rigor and Axiomatics in Modern Mathematis.” Fundamenta Scientiae 2: 205–19. Klamer, Arjo, and Colander, David. 1990. The Making of an Economist. Boulder, Colo.: Westview Press. Kline, Morris. 1972. Mathematical Thought from Ancient to Modern Times. New York:: Oxford. Kurz, Heinz D., and Salvadori, Neri. 1992. “Von Neumann's Growth Model and the ‘Classical’ Tradition.” University of Graz. Unpublished. Lax, Peter D. 1989. ”The Flowering of Applied Mathematics in America.” In A Century of Mathematics in America, Part II, edited by Duran, et al. Providence, R.I.: American Mathematical Society. Mandelbrot, Benoit. 1989. “Chaos, Bourbaki, and Poincaré.” Mathematical Intelligencer 11(3): 10–12. Mantel, Rolf. 1974. “On the Characterization of Aggregate Excess Demand.” Journal of Economic Theory 7: 348–53. Mathias, A. 1992. “The Ignorance of Bourbaki.” Mathematical Intelligencer 14(3): 4–13. Mirowski, Philip. 1989. More Heat Than Light. New York: Cambridge University Press. Mirowski, Philip. 1991. “The How, the When and the Why of Mathematical Expression in the History of Economics.” Journal of Economic Perspectives 5: 148–58. Mirowski, Philip. 1993. “What Could Mathematical Rigor Mean?” History of Economics Review 20: 41–60. Mirowski, Philip. ed. 1994. Natural Images in Economics: Markets Read in Tooth and Claw. New York: Cambridge University Press. Morgan, Mary S. 1990. History of Econometrics. Cambridge: Cambridge University Press. Mumford, David. 1991. “A Foreword for Non-Mathematicians.” In The Unreal Life of Oscar Zariski, edited by Parikh, Carol, xv–xxvii San Diego: Academic Press. Punzo, L. 1991. “The School of Mathematical Formalism and the Viennese Circle of Mathematical Economists.” Journal of the History of Economic Thought 13(1): 1–18. Reingold, Nathan. 1991. “The Peculiarities of the Americans, Or Are There National Styles in the Sciences?” Science in Context 4(2): 347–66. Samuelson, Paul A. 1947. Foundations of Economic Analysis. Cambridge, Mass. : Harvard University Press. Samuelson, paul A. 1983. “The 1983 Nobel Prize in Economics.” Science 222: 987–89. Schumpeter, Joseph. 1954. A History of Economic Analysis. New York: Oxford University Press. Sonnenschein, Hugo. 1972. “Market Excess Demand Functions.” Econometrica 40: 549–63. Stone, Marshall. 1946. “Lectures on Convexity.” Mimeo transcript prepared by Harley Flanders. Stone, Marshall. 1989. “Reminiscences of Mathematics at Chicago.” In Duren 1989. Tapon, Francis. 1973. “A Contemporary Example of the Transition to Maturity in the Social Sciences: The Peculiar State of Economics in France.” Duke University. Unpublished. Varian, Hal. 1984. “Gérard Debreu's Contribution to Economics.” Scandinavian Journal of Economics 86(1): 4–14. von Neumann, John, and Morgenstern, Oskar. 1944. The Theory of Games and Economic Behavior. Princeton, N.J.: Princeton University Press. Walton, Karen. 1990. “Is Nicolas Bourbaki Alive?” The Mathematics Teacher, November: 666–68. Weintraub, E. R. 1985. General Equilibrium Analysis: Studies in Appraisal. New York: Cambridge University Press. Weintraub, E. R. 1991. Stabilizing Dynamics: Constructing Economic Knowledge. New York: Cambridge University Press. Weintraub, E. R. ed. 1992. Towards a History of Game Theory. Durham, N.C.: Duke University Press. Weyl, Hermann. 1970. “David Hilbert and his Mathematical Work.” In Hilbert, edited by Reid, Constance, 245–83. New York: Springer Verlag. This piece is a slight modification of the paper of the same title that originally appeared in 1944 in the Bulletin of the American Mathematical Society 50: 612–54.